UDM Downloads > Picture to PDF! 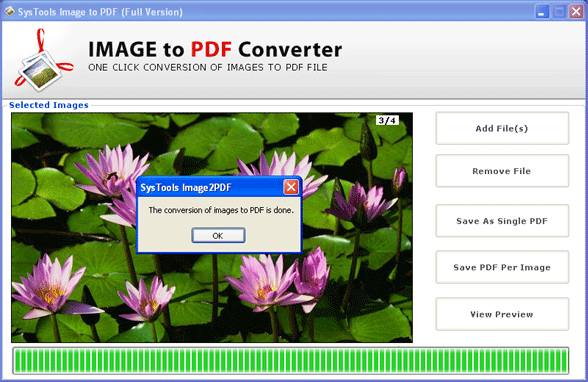 Are you searching Image to PDF converter software. Our Picture to PDF software gives you best and effective way to convert images to PDF files and provides best management for you. like (images, graphics, photos, pictures, snapshot etc) in PDF format for proper management? Now you are in a right place. Obtain SysTools Image to PDF converter software to convert pictures to PDF, photos to PDF or images to PDF file format. Pictures to PDF converter software can convert picture to PDF file without harming the original images. Our photo to PDF converter software is able to de-skew and de-speckle the B/W images for a clean document production. Picture to PDF converter software frequently convert GIF to PDF, JPEG to PDF, JPG to PDF, PSD to PDF and other file format PDF file format. Pictures to PDF conversion software have following features: * Convert pictures to PDF file including GIF, JPG, PSD, PCX & more file format * Creates single PDF for multiple images or individual PDF for every images * Converts several images into PDF file format at a time * No requirement of Adobe Acrobat or Reader software for conversion process * Compatible with all major Windows OS like Windows 98/ME/NT/XP/2000/XP/7 & Vista. SysTools Images to PDF converter is trustworthy tool for all legal users, home users, corporate users, lawyers and other all types users for its unique and effective conversion process. Demo of Picture to PDF converter software is free for evaluations. Demo will effectively convert pictures to PDF file with stamped word "SysTools Software". After satisfaction, purchase full version of SysTools Image to PDF conversion software.